Bore-Stroke Ratio is the ratio between the dimensions of the engine cylinder bore diameter to its piston stroke-length. The cylinder bore diameter divided by the stroke-length gives the Bore-to-Stroke ratio. The ‘Bore-stroke ratio' is an important factor which determines engine’s power & torque characteristics. The engineers also classify and categorize the automotive engines according to their shapes. It’s the shape of cylinders as seen from the side of the engine. What is a ‘Square Engine’ and how Bore-Stroke Ratio affects its design? An engine is called a ‘Square Engine’ when its cylinder bore diameter & stroke-length are almost equal which forms a geometrical figure of a perfect ‘square’. 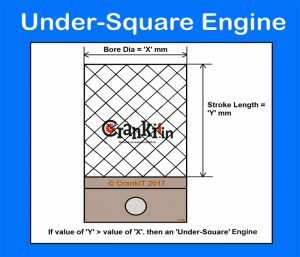 The bore-stroke ratio is almost 1:1 in Square engine design. For e.g. an engine with a bore diameter of 83mm and stroke-length of 83mm which forms a perfect square. It provides a perfect balance between speed and pulling ability. 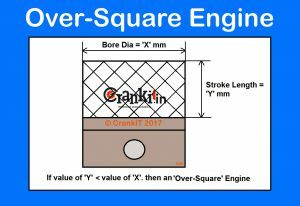 What is an ‘Over Square’ Engine and how Bore-Stroke Ratio affects its design? An engine is called an ‘Over-square’ engine when its cylinder bore is wider than its stroke. In this design, the stroke-length is shorter than the cylinder bore. Manufacturers also refer it as a ‘short-stroke’ engine. Generally, ‘Over-square’ design tends to produce higher engine speeds. Therefore, engineers refer to it as a ‘high-speed’ engine. As the stroke-length is short, the piston has to travel a shorter distance. Hence, this design tends to produce higher engine speed and is typically used in high-speed cars & bikes. ‘Over-Square’ engine has the bore-stroke ratio greater than 1:1. For e.g. an engine with the bore diameter of 83mm and stroke-length of 67mm which forms an ‘over square design’. Less frictional losses & load on bearings. Reduces engine height thereby lowering the bonnet line. What is an ‘Under Square’ Engine and how Bore-Stroke Ratio affects it? An engine is called an ‘Under-square’ engine when it has a longer stroke. In this engine, the stroke-length is longer than the cylinder bore. Generally, ‘Under-Square’ design tends to produce comparatively higher torque. Hence, engineers also refer to it as ‘high-torque’ engine. As the stroke-length is long, the piston has to travel a longer distance which tends to increase engine’s torque. Hence, the manufacturer typically uses it in commercial vehicles such as trucks, buses and earth-moving equipment. ‘Under-Square’ engine has the bore-stroke ratio lesser than 1:1. For e.g. an engine with a bore diameter of 70mm and stroke-length of 83mm which forms an ‘under square design’. The engine manufacturers try to attain the near-perfect ratio from these designs depending upon the application for which they intend to develop the engine. 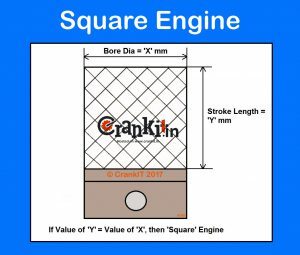 Home » Technical Anatomy » What Is Bore-Stroke Ratio and Square Engine Design? Common Rail Direct Injection – What is CRDi Technology?